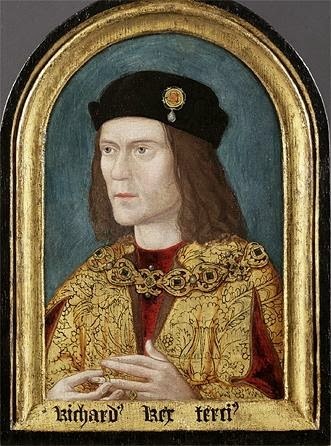 Leicester has always been very proud of its historical roots, and particularly with regard to its association with King Richard III. There are many sites of historical interest here, all with a connection to him. There are a number of tours in the city centre which show visitors around all the relevant sites, and on the 2nd June this year, an new tour called 'The King's Tour' was added to the list. I was very interested to see what this tour included, so I booked for myself and my daughter to go on the very first one! The tour itself is conducted by a Blue Badge tour guide, meeting up outside the Cathedral. We were then taken on a walking tour of all the famous sites including Bow Bridge, the Newarke Gateway, Castle Gardens where the now- famous statue of Richard currently stands, the site of the old Blue Boar Inn (although it is said it was originally the white Boar Inn prior to Richard's defeat at Bosworth!) where King Richard reputedly spent his last night before the battle (now a Travel Lodge! ), Leicester Castle, then back to the Cathedral to visit the Exhibition. We were also fortunate enough to be taken into the council car park to look at the actual open grave, although it was protected under a plastic tent, before the secondary excavations began digging up the whole area. After a short break we were directed to a coach which took us to the Bosworth Battlefield and Heritage Centre. There we had a look around the fantastic exhibits, reading lots of information and having the opportunity to try on helmets and breastplates (very fetching with my denim jacket!). Then we joined a guided tour of the area around the battlefield with a talk on Ambion Hill, and had the opportunity to take part in an owl flying display! After tea and cake in the coffee shop there we had time to look around the gift shop and buy some souvenirs before getting the coach back to Leicester. I bought a white rose and a silver boar pin badge (a replica of the one found in excavations of what is now thought to be the actual battlefield site, 3 km south west of Ambion Hill). Please don't forget to sign the petition to keep King Richard III here in Leicester if you have not already done so! The links for both petitions (UK and non UK) are at the top of my page on the right hand side. Thank you for your support!